If you are considering having a patio cover installed at your home, look no further than SRA Home Products. We install strong, durable patio covers manufactured by TEMO throughout Warminster, Willow Grove, and many other communities in Pennsylvania. TEMO has extensive experience in the outdoor living product industry and has developed a variety of structures to improve the outdoor areas of homes across the country. Unmatched durability – Because they are made with heavy-duty extruded aluminum materials, the patio covers we install are among the most durable on the market. Elegant style – Your patio cover will have one of three aesthetically pleasing Italian-inspired column designs that you can choose from, so you are sure to find something to match your style preferences. Low maintenance requirements – TEMO patio covers won’t rot, chip, or peel, so you can be sure that yours will continue to look like new with little-to-no maintenance requirements. Exceptional protection – Every patio cover we install is backed by TEMO’s limited lifetime transferrable warranty, so you can feel good about making this investment in your home. In addition to the high-quality products we install, another reason homeowners choose us to install their patio covers and other outdoor living structures is our dedication to providing an exceptional experience from start to finish. Our factory-trained and -certified employees, who handle every installation job, are known for their professionalism, positive attitude, and respectful nature. You are sure to be impressed by their expert craftsmanship, and the peace of mind that comes with knowing your patio cover is being installed properly. 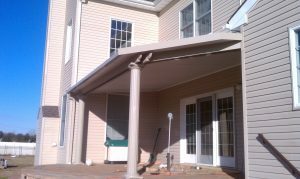 For more information about the many benefits of having a TEMO patio cover efficiently installed at your Warminster or Willow Grove, PA home, call SRA Home Products today. We are happy to schedule you for a free at-home consultation.